Mae Travels: Hello, World! We're back from our trip. Hello, World! We're back from our trip. Here are a very few highlights of last week's trip to Panama and Costa Rica. I had always wanted to see a sloth. 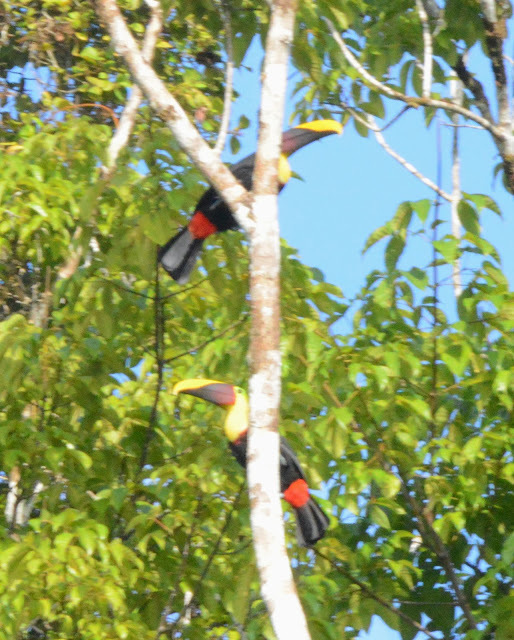 I had always wanted to see the Panama Canal and to see a toucan. We saw them all, and much more. We started at the dock in a large cargo port in Colon, Panama. We quickly entered the first set of locks on the Panama Canal, which was as fascinating as we expected. In Panama and Costa Rica we enjoyed many nature walks, seeing a very large number of species of plants, birds, reptiles, monkeys, fish, whales, dolphins, and little critters. A false killer whale beside the ship. You can just see the anchor at left. They love to surf in the ship's bow wave. Later some dolphins did the same thing. I'll be adding more posts about the ship, the trip through the canal, and all the wildlife we saw. Well, the first thing I notice here is that it is green and looks warm -- which I call a refreshing change of pace! And fun! Looks like we're getting slammed again tonight... will it ever end?